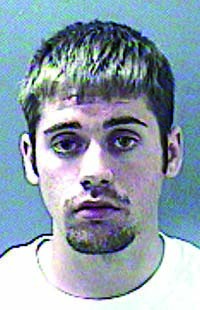 A Blaine County grand jury has indicted a 19-year-old Bellevue man on two felony charges in connection with the death earlier this month of a Ketchum man on the north side of Magic Reservoir. In an indictment issued Friday and unsealed Monday, Steven Tyler Jameson is charged with felony vehicular manslaughter and a second felony charge of leaving the scene of an accident resulting in injury or death. Jameson is accused of causing the death of 26-year-old Stephen Ray Franco on June 2 by striking him with a vehicle and knocking him off a cliff. The charges are the same as those contained in an earlier criminal complaint filed against Jameson following Franco's death. With the grand jury indictment, the case went directly to Blaine County 5th District Court, avoiding the legal necessity of a preliminary hearing in the lower magistrate court. At a preliminary hearing, a magistrate judge must determine whether there is sufficient evidence to bind a case over to the higher court for further prosecution. Jameson was arraigned on the charges Monday morning before District Judge Robert J. Elgee, who advised the defendant that if it is proven that he was intoxicated at the time of Franco's death, he could be sentenced with to up to 15 years in prison. Elgee told Jameson that the crime of leaving the scene of an accident resulting in injury or death is punishable by up to five years in prison. Jameson is also charged with the misdemeanor offense of driving without a license, a crime punishable by up to six months in jail. Wearing jail-issue orange and shackled at the wrists and ankles, Jameson pleaded not guilty to all three charges. He has remained incarcerated on $250,000 bond since his arrest on the evening of June 2. According to Blaine County court records, Jameson has a lengthy juvenile criminal record and has previously been incarcerated under the Idaho Department of Correction juvenile detention program. Jameson is represented by Ketchum attorney Brian Elkins. Elgee scheduled a jury trial, expected to last five days, to begin Oct. 16. According to the Blaine County Sheriff's Office, Jameson and Franco were at a party with about a dozen other people on the west side of the Poison Creek inlet to the reservoir when the accident occurred shortly before 4:30 p.m. on Saturday, June 2. Sheriff Gene Ramsey reported that Franco was standing behind Jameson as Jameson backed up a vehicle and that the vehicle struck Franco, knocking him off a cliff. Franco, who suffered head and chest injuries, was flown by emergency helicopter to Boise but was pronounced dead upon arrival at Saint Alphonsus Regional Medical Center.